The Blade 350 QX quadcopter is an almost-perfect example of its class. Three flight modes provide almost the perfect range from well behaved and safe to crazily agreeable to any insane set of control inputs you supply. It is light, provides a reasonable flight time with the supplied battery, and you’re pretty well guaranteed to have more fun than you expect fooling around with it. But that’s not all. 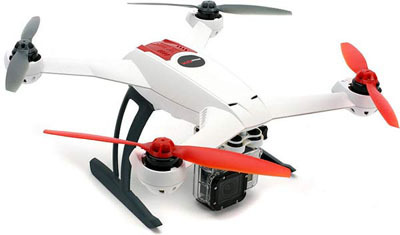 The 350 is powerful enough, and stable enough, to carry a Go Pro camera and take awesome HD movies and stills from the air. You can spin the quadcopter in place and create a fabulous pan, or fly right up to something you otherwise can’t get to and take a closeup. Or just fly around and take a look at the countryside. Everything you need is supplied in the package; the quadcopter, the hand controller, batteries, a charger (12 vdc… meant to hook to your car’s electrical system so you can recharge in the field), and you even get a set of extra blades. Which you are unlikely to need if you are even just a little bit careful. The manual is a little dense, and because of that you’ll have to read it carefully, but everything you need to know is actually in there within twelve pages.